Wisdom is not automatic, no matter what the old-timers might imply (or outwardly state) about themselves. Learnable moments appear and, sure, some lessons are hard to avoid learning. If one steps on button and a rock falls and hits one on the head, as a result, one learns not to step on that button again. Laboratory rats have learned similar lessons, though, so no glory there. But real wisdom takes work and commitment to the quest. Inevitability, the "youth is wasted on the young" aphorism comes to mind, because once we acquire certain nuggets of wisdom, we want to share them with those who have not found them yet. Parents try earnestly to do this for their children. Of course, the most important job of a parent is to teach his or her kids to think clearly and logically, not what to think. Still, the most important lessons we have learned carry with them certain truths. Although we know our kids must walk certain paths in order to truly understand, we hand them what might well be irrelevant trail maps, expecting them to truly know without ever putting their toes in the dirt. 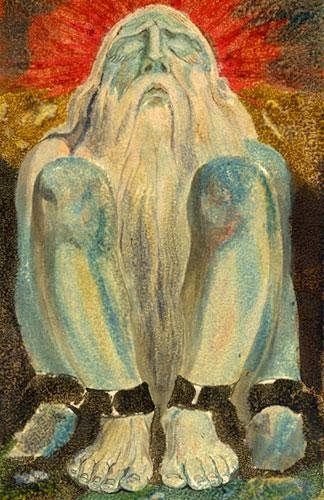 William Blake's "mind forg'd manacles"
It's hard to resign to the ineffectual nature of this desire to teach. Can it really be that all of the wisdom the hard-working thinker acquires is useful only to himself? On one level, I like the idea; it affirms the importance of individuality. On the other hand, as a member of a social species, it makes it all seem like a bit of a waste -- not a total loss, but contrary to the sharing instinct I, and most of us, have. I'm lucky that my boys are not really eye-rollers; that they want to listen to my ideas. I don't know -- maybe with the map in their hands, they will be more ready for the paths they might find. The alternative is to stop trying, and that is not okay, for me. ...to truly drop the mind and culture-forged manacles that the fake life would have them wear.